The new-generation Audi A4 is what a sensible daily all-rounder is. From Quattro all wheel drive and a smooth engine, the A4 has been the go to car for young adults and small families. 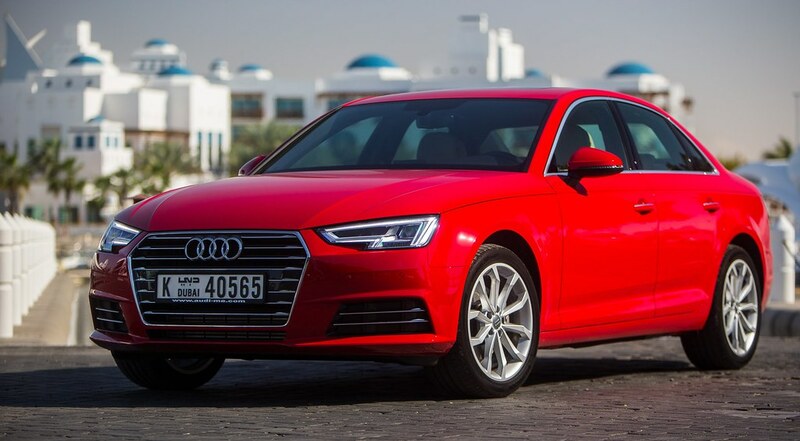 for 2016, the new Audi A4 brings in a refreshed look and and all new interior. Below are are some technical briefs on the new car, and we will soon give you guys a full review as soon as we get our hands on the vehicle. A good example is aerodynamics: The A4 Sedan has the best drag coefficient in its class at 0.23. The new models also have impressively low CO2 emissions. The most powerful engine for the Middle East will be a four-cylinder unit with 252 hp, S-tronic and quattro wheel drive. Driver assistance systems and infotainment are of luxury quality. A new generation of four-cylinder TFSI engines with newly developed combustion methods sets benchmarks in terms of fuel consumption, emissions and performance for four-cylinder gasoline engines. 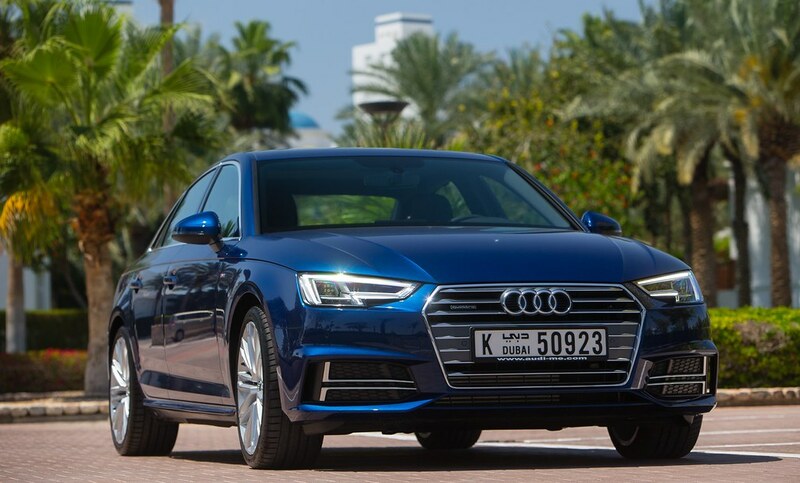 Expected arrival date for the the A4 Sedan in the region is first quarter of 2016. 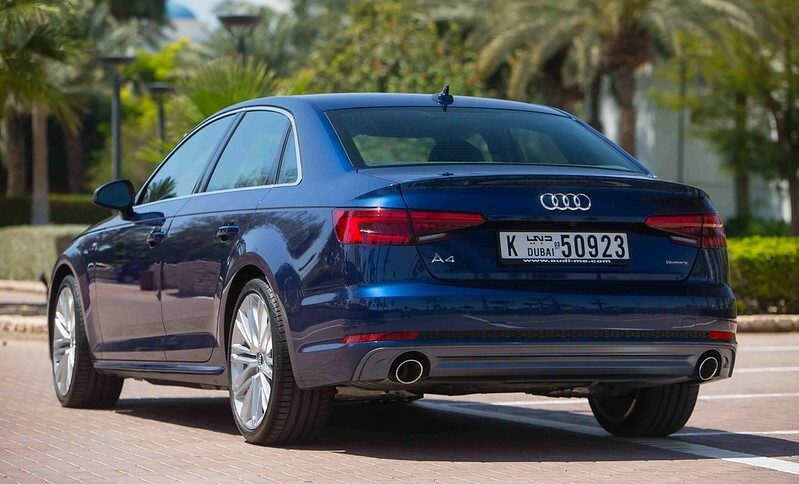 At 4.73 meters long and with a wheelbase of 2.82 meters – the new Audi A4 has a confident stance on the road. A prominent horizontal line on the front and rear emphasizes the car’s width. The flowing design with concise lines communicates the sporty elegance of the brand. The Singleframe grille is wide and low; the optionally available headlights in LED and Matrix LED technology (including dynamic turn indicators) make technology a visual trademark. The Audi A4 is a leader in its class also in terms of noise levels. All occupants enjoy generous space; the smooth lines emphasize the width of the interior. The front of the dashboard features a broad band of air outlets and a large decorative surface. At night, optional discreet contour lighting illuminates the doors and the central console. The quality of workmanship is uncompromisingly high. Colors and materials follow a new line concept allowing customers even more freedom during configuration. The new model offers an abundance of intelligent technologies, the use of which is even more intuitive with the new Audi MMI display and control concept. Technological highlights of the new A4 include the Audi virtual cockpit, the Audi Matrix LED headlights, the Audi smartphone interface, the Bang & Olufsen Sound System with 3D sound, the Audi phone box with wireless charging, the head-up display and new driver assistance systems like the parking assist, rear cross-traffic assist, exit warning, collision avoidance assist, turn assist and the Audi pre-sense systems. The focus here is on two innovations. The optional Audi virtual cockpit, a fully digital combination instrument, features a 12.3-inch LCD screen that displays the most important information in brilliant high-resolution graphics, with great detail and sophisticated effects.